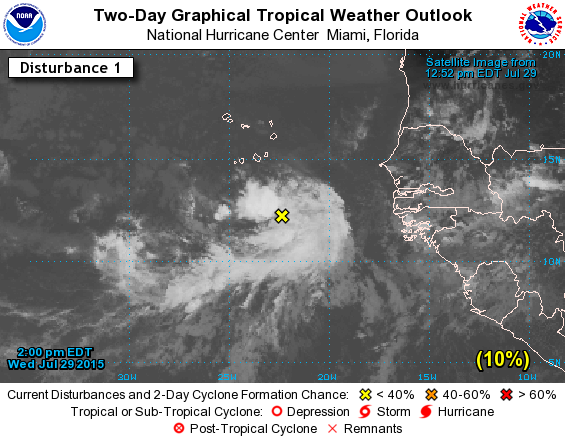 Last week I posted on the very active tropical Pacific Ocean with four storms occurring simultaneously. Tropical Cyclone Pam (17P) made a devastating visit to the island nation of Vanuatu as a Category 5 (145 kts or 165 mph) cyclone and has since joined the westerlies after passing near New Zealand as a much weaker system. Currently, the majority of the region has quieted down some, but Tropical Cyclone Nathan (east of Queensland) and Tropical Storm Bavi (West Pacific) are still active, while Tropical Cyclone Olwyn dissipated after making landfall in Western Australia. 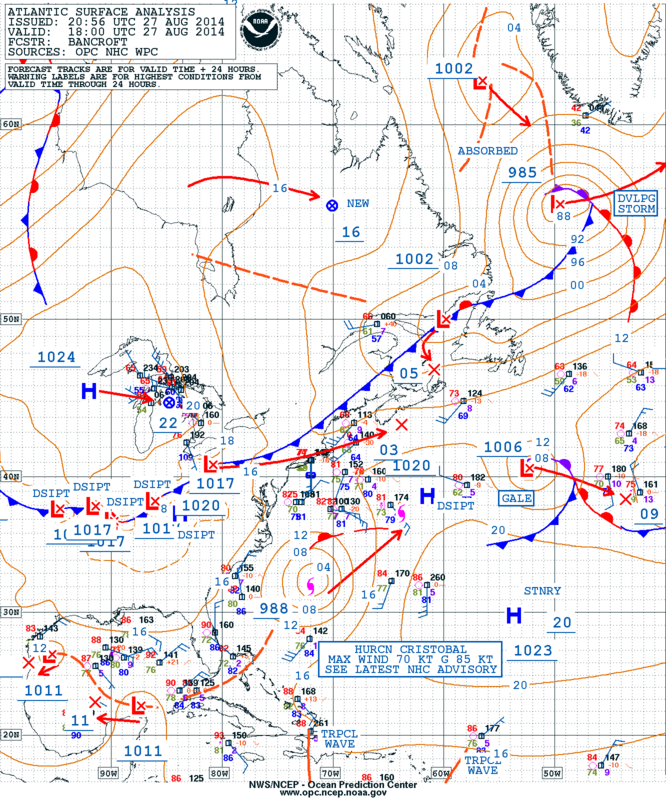 Jim Kells (OPC) compiled a few animations that show the evolution of all four tropical cyclones starting on 03/08/15. The imagery is courtesy of the MTSAT-2 satellite and we are eagerly anticipating the new Himawari-8 satellite data over the next few months. MTSAT-2 Infrared satellite animation of the four tropical cyclones developing in the tropical Pacific and Indian Oceans valid from 03/08/2015 – 03/16/2015. MTSAT-2 Infrared (enhanced) animation similar to the previous animation. MTSAT-2 Water Vapor animation valid from 03/08/2015 – 03/16/2015. So why did it suddenly get so active? NCEP GEFS forecast of the Madden-Julian Oscillation (MJO) courtesy of the Climate Prediction Center (CPC). The MJO is currently near or at a record amplification in Phase 7 and as it swung through Phase 6 to 7, a strong westerly wind burst developed near the equator, while there was enhanced upward motion or ventilation at 200 mb. This has also been coupled with a sudden drop in the Southern Oscillation Index (another ENSO indicator). Empirical Wave Propagation forecast for the next 40 days courtesy of CPC. According to one forecast (above), the Empirical Wave Propagation forecast shows a return of favorable tropical cyclone formation conditions (green shading) appearing in the same region from the end of March into early April (the season typically winds down in the Southern Hemisphere after April). Sea Surface Temperature animation from 12/24/2014 – 03/11/2015 in degrees Celcius courtesy of CPC. Sea Surface Temperature Anomaly animation from 12/24/2014 – 03/11/2015 courtesy of CPC. Finally, notice that this region is where the warmest SSTs reside in the tropical Pacific, along with the strongest warm anomalies. This is typical of a Modoki El Nino where the warmest conditions are in the Nino 3.4 region or near the Dateline. Also notice how the water near the coast of South America is colder than normal. This shows a mixed signal and makes one wonder whether El Nino conditions will be maintained or expand east with time. . . 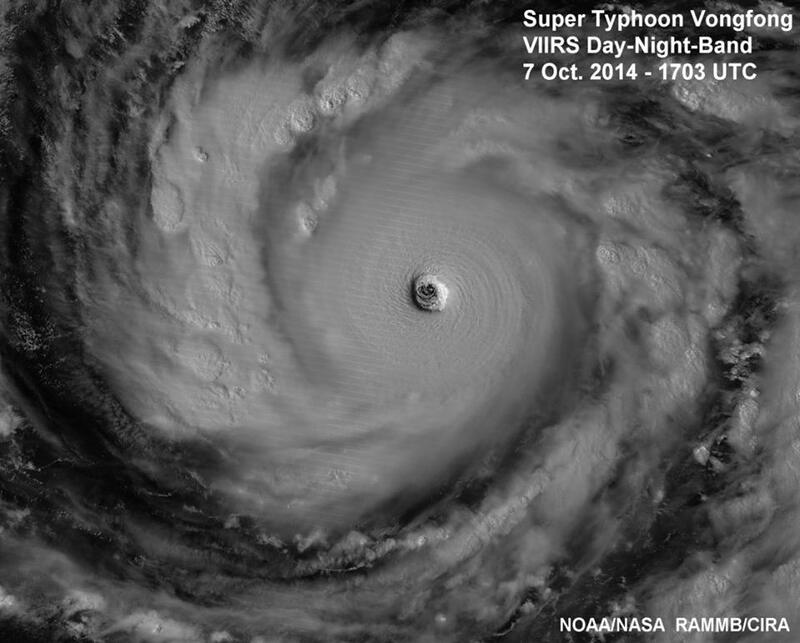 It must be October. . .Super Typhoon Vongfong! There are certain things you can count on seeing in October. Great post-season baseball! Pumpkin flavored everything! Halloween! Super Typhoons?! To celebrate the successful launch of Himawari-8 from Japan last night, I thought it would be appropriate to post on this latest super typhoon. Super Typhoon Vongfong has intensified impressively in the last 24 hours after passing through the Marianas Islands yesterday as a Category 2 typhoon with winds ~105 mph. As of 1500 UTC, the Joint Typhoon Warning Center initialized Vongfong as a 135 kt (155 mph) super typhoon and the Satellite Analysis Branch (SAB) of NESDIS classified it as a T7.0, which would support Category 5 winds. Since that time, there has been a slight warming of the cloud tops surrounding the eye, but there is no strong indication of an eyewall replacement cycle, yet. It’s possible that Vongfong may still strenghten some in the next 12-24 hours. MTSAT2 infrared imagery with GLD-360 Lightning Density overlaid at 30 min increments for Super Typhoon Vongfong. The satellite animation above shows Vongfong’s rapid organization overnight with intermittent lightning bursts in the eyewall during the rapid intensification. Typically, hurricanes and typhoons don’t exhibit much lightning due to the lack of convective available potential energy (CAPE) and dry air near the strongest thunderstorms. During intense thunderstorm growth, most notably in the outer rain bands, there can be some graupel (soft hail/snowballs) which supports lightning, but the inner core is usually quieter (of course, this varies based on basin). We have seen this before in the West Pacific (see posts on Haiyan and Rammasun). 89GHz RGB image from AMSR-2 on JAXA valid on 10/07/14. 89GHz RGB image from GMI on GPM valid on 10/07/14. The two microwave image passes above show the convective structure of Vongfong under the clouds where the red coloring indicates heavier precipitation or convection. These high resolution microwaves images are used by JTWC, SAB, and the National Hurricane Center when classification are being made, especially for fixing the initial center positions. 89 GHz RGB image from TRMM with GLD-360 lightning strikes overlaid valid on 10/07/14. Another interesting way of looking at the microwave imagery is with lightning overlaid. The lightning strikes for the previous 30 minutes were overlaid on this 0719 UTC Tropical Rainfall Measurement Mission (TRMM) satellite pass. As you can see, the lightning matches up quite well with the red colorings (convection). Notice the lightning cluster in the southeast eyewall! Finally, this incredible Day-Night Band (DNB) image was captured by the S-NPP satellite this afternoon. That is not a traditional visible satellite image. . .that is from the moon light! The Proving Grounds receive DNB imagery from NASA SPoRT and CIMSS on a routine basis to help forecasters identify significant features and help with center fixes of tropical cyclones, similar to the microwave imagery.